It took me a while to realise the importance of developing social media accounts to increase the traffic to my blog, and I didn’t do anything other than write and press the publish button for the first year. This suited me – the purpose of the process was for therapy, a way of being able to try and discuss the issues that had been plaguing me for a long time. However, for the last eighteen months I’ve worked hard to build up various areas of social media and effectively use it to promote my posts, with what I would consider to be a success. However, there is one area that I have consistently ignored: Pinterest. I have a Pinterest account: http://www.pinterest.com/suzie81speaks&#8230; I’ve had the account for months, and I’ve done nothing with it. The idea of Pinterest itself is easy – create boards of similar themes, share images and posts from your blog and pin others. However, despite this, I avoided it because there are lots of things I didn’t really understand. I’ve heard on many occasions that Pinterest is one of the most effective ways to boost traffic, so why weren’t hundreds of people re-pinning my posts? Over the weekend, I received an email from the lovely Elena from Fabulously 50 & Living With Batman. She’s an avid pinner, increasing her Pinterest activity by nearly 500% recently, and she had very kindly analysed my productivity (or in my case, lack of) on my account. Her hints and tips were absolutely amazing. Basically, I was doing everything wrong, and I’ve spent the last two hours attempting to start to change everything around based on her advice. Even better, I’ve had a blast doing it, which surprised me as I found Pinterest quite a monotonous task before. Add my blog link to the description of each of my boards. Created a group board and invited other bloggers to share their posts. I’ve participated in one of Elena’s shared boards and it has been a great way to see more blog posts, so I’ve started my own. Created different boards of things I am interested in: running, hair and beauty (ie, things that I could do myself without looking like a panda), photography, food, motivational quotes, Birmingham… I’ve gone pin crazy adding things that have inspired me. Started working on keywords to put in my titles and descriptions. However, this is just a fraction of the advice that I was given from Elena, as she had taken the time to give me long, medium and short term goals, as well as pointing out things I was on the right track with. Similarly, I want to find you on Pinterest! Hop on over to my page and check it out! What about you guys? Are you a pin fanatic? I have just started to work on Pinterest to promote my blog. I changed my personal account to my blog and have cleaned up some of the boards. I hadn’t thought about mentioning my blog url on all board pages. Thanks! Ooh that sounds productive! Let me know how you get on – check out Elena’s post for some proper advice! Similarly, I’m trying. I swear I am. I am probably the worst 25 year old female in the digital age, not understanding Pinterest. I just don’t get it. I’m totally the same. But like you I’m trying haha! 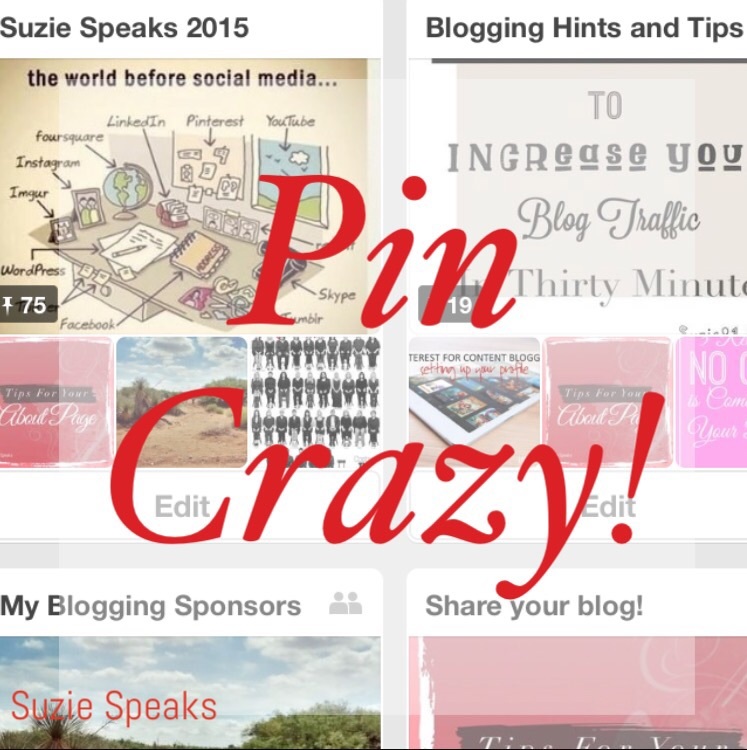 Right now I like Pinterest for the fact that you can embed a pin directly into your post. This is great when you want to use a picture of say a movie star but don’t know who has rights to it. Essentially your embedded pin is a link to where you found said picture. Also I find it nice for creating boards to collect a certain series of posts. However I’ve not really spent enough time there to figure out how to generate traffic towards my blog. Thanks for the info I will be checking out the blogger you mentioned. I’m still learning all of this sort of stuff… Check Elena out – I’m sure she’ll be happy to see you! Haha! I had images of Hellraiser then! You are a super star! I am so pleased you found my service helpful but I am more impressed at your ability to grab the bull by the horns and jump right in. I am sure you will see a great return very quickly. Thank you so much for the review. You opinion and input is so greatly appreciated. It was really useful my lovely – I’m sure there are lots of people who would benefit from your advice! Thanks my lovely – it was Elena that provided the inspiration! I’ve separated out loads of stuff today. I’m not quite sure Ive done it right, but we’ll see! I don’t even have a pinterest account! So far, I’ve only tried to work with my Facebook, Instagram and Twitter (have to say that I like Instagram the most, but Twitter and Facebook work the best). But you definitely got me interested! Gonna go and check this out. I never really got a hang of this Pintrest thing. Maybe I should give it a go. Two posts on two different blogs on how great it is today. I take it as a sign. Maybe..
I’m still learning, and I wouldn’t say it’s had any impact on my traffic as yet, but I’m going to try and follow Elena’s advice and see what happens! Slowly but surely I might start using Pinterst more and more and hopefully get better at it. At the moment I’m quite the novice and must say I don’t understand it all. I went to visit Elena’s blog and found some good advice there too. So much good advice on how to use pinrest and here I am still a snail. I’m totally with you – I’m still trying to get my head round it. So pleased you visited Elena’s blog – it’s great! Her blog is very good! Elena said to post for a few minutes several times a day – I’m certainly going to give it a go! I tried Pinterest but it’s not for me. I’m happy enough with my Twitter, Flickr and YouTube accounts. Although my YouTube ones are needing a refresh my Flickr one seems to be looking okay – what do you think? I haven’t been onto your Flickr. The Bloke loves Flickr, he’s had an account for years! Haha! I’ll leave it to The Bloke! I’ve been on pinterest for a long time now, but just recently started using it for my writing and soon to be published books. I’m always on the lookout on how to use this tool more effectively. So thanks! Thanks Jackie! I’m glad you’ve joined my group board too! I need this. I like Pinterest, but I haven’t found a way of incorporating it to my content. Will digest this later and put it to work, thanks! Great! Hope it’s useful – we can build up our knowledge of it together! I’m still very much a newbie! Oh I LOVE Pinterest!!! I’ll try find you. I’m always on it. Ooh great – see you there! I ADORE Pinterest – when I’m just pinning for myself and my own reference (hair styles I like, recipes I want to try etc) but I set up a separate account for my blog and I’m finding that pinning for promotion is kinda sucking the fun out of it I will try again though as a few bloggers have said how successful it is. I have a pinterest account and decided to make it a business account after Pinterest hounded me, and that allows me to see the analytical activity of each pin. But I haven’t gotten any traffic on the board about my blog just the boards of my own personal interests. It’s discouraging. I’ll have to schedule a couple of blog posts ahead of time to leave the leisure time to work on just that project. That’s great! It’s inspired me to keep going with it! Because of your amazing blog I have nominated you for the Liebster Award! Your blog is completely outstanding and I can tell you are truly dedicated to blogging which is something to be proud of. Your content is amazing and I love the wide range of topics. You need to make a blog post answering 11 questions and then nominating 11 other bloggers. Everything is in the link I have provided! I am looking forward to more content from such an amazing blogger! Thank you very much – that’s very kind of you! Thanks for the reblog Angie! Thanks Holly! I’m finding that too – Ive gained new followers but generally on boards other than my blog haha! Still don’t get pinterest, and honestly have no really feelings towards it!